Wawa’s In The Club! | DidjaEat? Wawa’s In The Club! The club sandwich that is. Or, at least, thier version of it. I love a good club sandwich, preferably with extra mayo. Don’t bother putting it on the sandwich, just roll out the 5 gallon jug of Admiration mayo and put it on the table. That oughtta do it. Club sandwiches are a pleasant memory for me as well. My Grandmom (the dead one) used to really like them. I remember the frilly toothpicks she would remove before destroying that thing in a cloud of fingers, crumbs and stray lettuce. She was a real inspiration. I rolled into the Bridesburg Wawa after getting the rundown on cat sitting for my friend MellieFlo on a rainy friday night. I had to eat, so I strolled over to the computer screen to order a classic hoagie (It IS Hoagiefest ya know!) 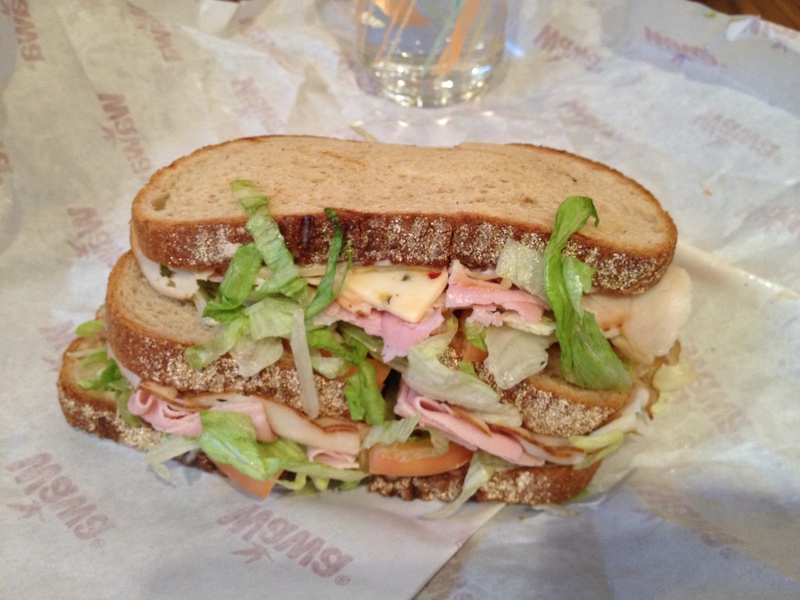 when I see this new thing pop up…club sandwiches! WTF Wawa? I thought we were tighter then that, you didn’t even mention it before! They now offer Roast Beef, Ham, Ham and Turkey and Straight Up Turkey on wheat, rye or white bread. Bacon is included, as it should be. An odd thing tho, they don’t offer to let you have extra mayo, which made the mayo beast MIGHTY ANGRY at the time. I got over it tho, don’t worry. You can’t really customize it like you can a hoagie, except for creamy horseradish sauce and adding extra meat, cheese or both (I go both. I mean, why wouldn’t you?). I also got the club on rye. I had to have it toasted even tho I don’t get toast when I order it out and about. That turned into a nonissue, as you will soon see. 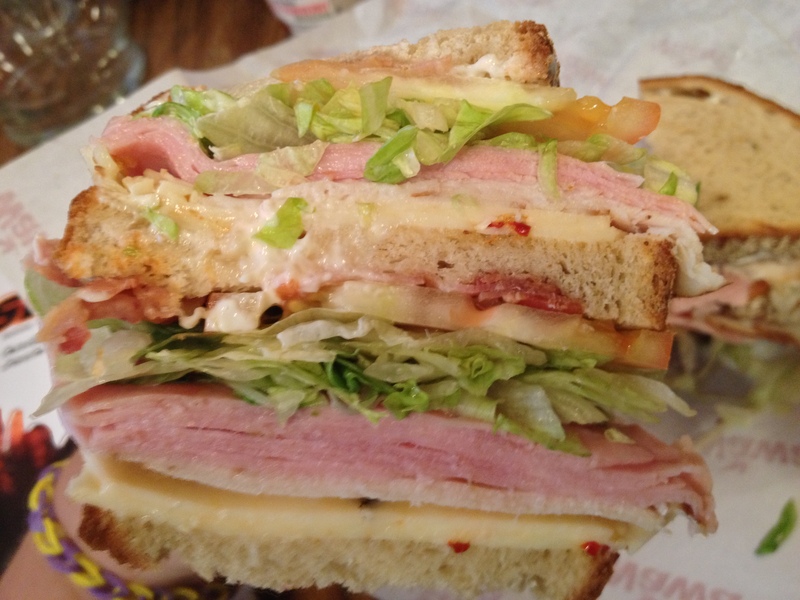 So here it is, the Wawa Ham and Turkey with Pepper Jack Cheese Club. Cut in half and not quarters. I’m not gonna lie, it looked a little odd. It was a sloppy looking thing, but I was intrigued and gave it a go. I mean, why not? good. Could it have used some pickles? Or extra mayo? Yes, indeed. But it had the right amount of meat and cheese on it, probably because I ordered the extra meat and cheese. When you are dealing with a sandwich that has a lot of bread, you kind of need to bulk it up a bit. Wawa does use some thin bacon for it’s sandwiches. It reminds me of the Oscar Meyer precooked bacon: tastes good but a stiff breeze would crumble it to the ground. 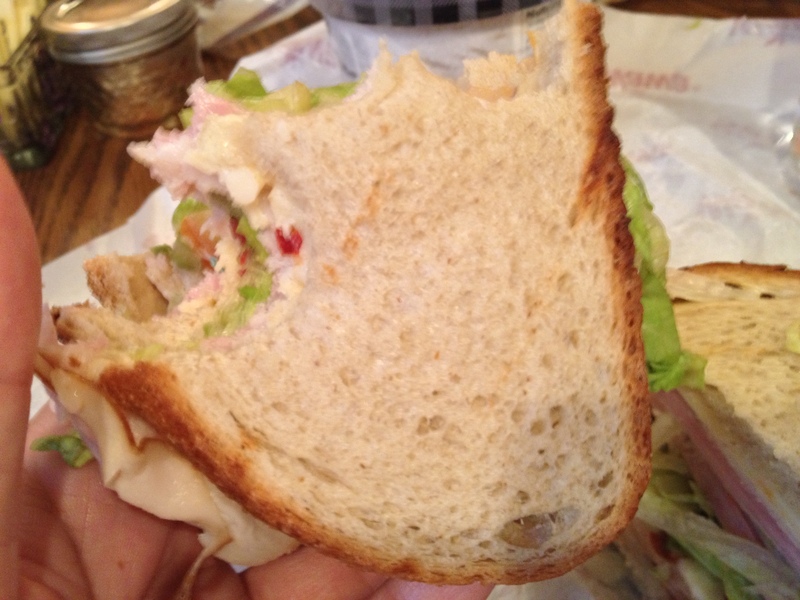 It gets a little lost in the sandwich, which was a little bit of a bummer. What was really bizarre was the toast. I normally do not order my club bread toasted. It rips up my mouth like Captain Crunch. It’s no good for me. But the Wawa computer gave no option for the bread not to be toasted, so I bit the bullet and rolled with the mouthroof punches. Except, when I got home, I opened it up and the bread must have just walked thru the toaster becasue it was barely toasted at all. Look at this picture! Does that look toasted to you? Very bizarre! So, altho I did not like the lack of extra mayo and the lack of being able to customize my sandwich, did I like the club? You know what? I really did! It was just filling enough and left room for me to have a little dessert. Check it out, it wasn’t perfect but it was still pretty delicious! Posted on July 12, 2013, in fast food, sandwiches and tagged bacon, club sandwich, ham and turkey club, pepper jack cheese, rye bread, wawa. Bookmark the permalink. Leave a comment.